Liverpool LightNight is part of ‘Museums at Night’ a national after-hours festival of arts, culture and heritage. As LightNight virgins we were honoured to be asked to be part of this year’s celebrations. And, after such a hugely successful evening we decided to write a ’round-up’ blog about it! “I wanted to design and carve something thought provoking and poignant to add to the LightNight programme of events. After researching WW1 imagery and posters, I took the ‘Kitchener’ image and altered the order around slightly. It was then that I decided to use the hand pointing as part of the sculpture that can be used as an interactive element of the sculpture. I want it to be a beautiful piece of art against the backdrop of The Liverpool Cathedral “. Read Mat’s full interview with the Liverpool Echo Here. First design sketch of the LightNight ice sculpture. 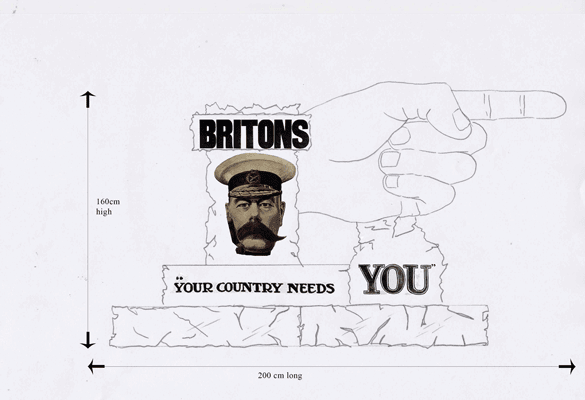 The iconic Lord Kitchener slogan ‘Your County Needs You’ was intended to spark conversation, debate as draw attention to issues around war and conflict, something that is still very relevant to today. 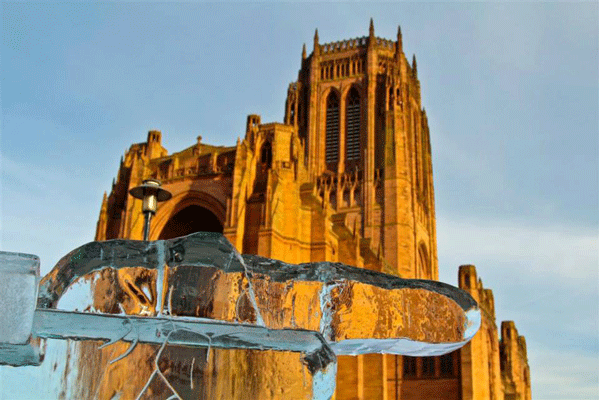 The ice sculpture starts to take shape against the backdrop of the iconic and beautiful Liverpool Cathedral. 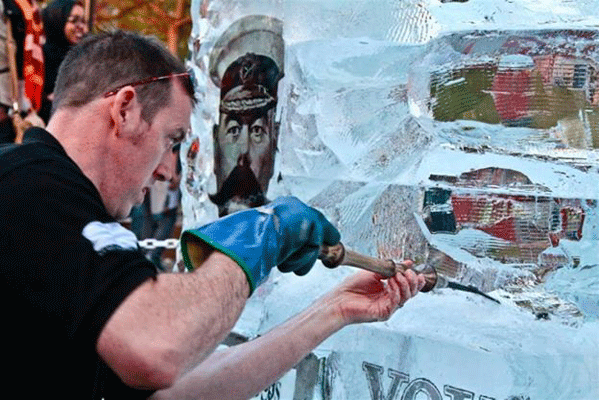 Master Carver, Mat Chaloner demonstrates his ice sculpting expertise in front of LightNight audiences. 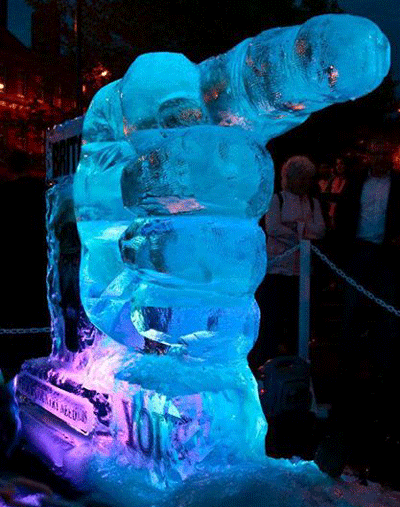 The sculpture comprised of over nine blocks of ice in total, weighing just over 1 tonne. It was hand carved live over 4 hours in front of LightNight spectators. 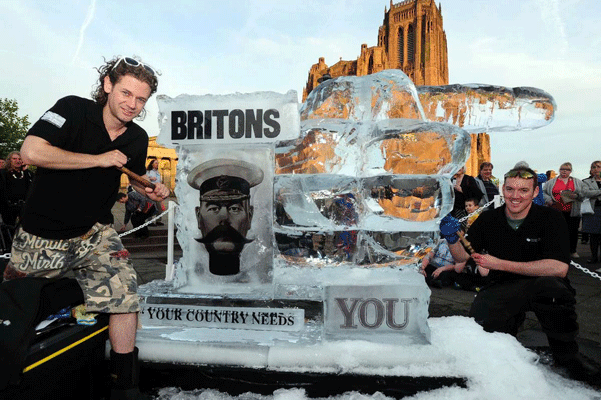 Co-owners and ice sculptors’ Mat Foster and Mat Chaloner with the LightNight sculpture. Carving nearly complete, lighting is added to illuminate the sculpture. Christina Grogan, producer of the event, described it as the “biggest and best LightNight yet”. Read the BBC story here A full review of LightNight from the Liverpool Echo can be viewed here . Peter Guy’s Getintothis photo round up from blog viewed here and Footage of the evenings events can be viewed here. 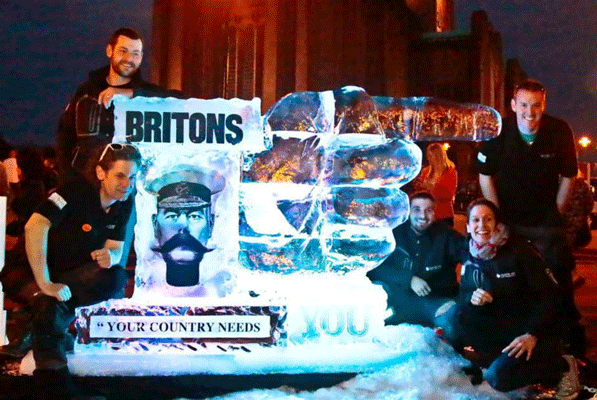 The Glacial Art Ice Sculptors team with the finished LightNight ice sculpture. A huge thank you to everyone who visited, commented and interacted with the sculpture. A big thanks to the Liverpool Cathedral for the plateau space and to the organisers, Open Culture for allowing us to take part in a fantastic evening. Hopefully we’ll see you for the next LightNight!